We are best in class builders, and we also consider ourselves Leaders in Process. The perception is that our product is not only what we build, but the experience we create for our clients along the way. Effective coordination begins with the client and moves through a team of dedicated stakeholders that are supported by architects, engineers, designers, subcontractors, vendors, and local governance. This is where we excel. We employ the best and brightest craftsmen in the industry. In addition, we leverage the most effective management tools at our disposal. For instance, sophisticated financial reports, Gantt charts, and critical task lists, ensuring cohesiveness throughout the project. At the end of every project, we study performance with an After Actions Report. This is where we capitalize on opportunities for improvement and newly identified best practices. These reports are saved and reviewed frequently to ensure that we learn from our past experiences and are always progressing towards a more effective and efficient organization. Part of our mission statement is ‘Newschool Vision’. We live by this! At Newschool Builders we stay abreast of the latest developments in building science, as well as implementing the most cutting edge management systems. After we identify our competitive advantage, we invest the requisite time and energy to educate our team on means and methods. By consistently pushing ourselves to stay current in building science and management systems, we are able to be creative and efficient with your project. This is how we ensure delivery of the highest quality product and client experience that our industry has to offer. Our estimating process is not arbitrary. Our systems allow us to maintain accurate historical records of cost coded expenses on every job we have ever run. We apply this data to the estimating process for new projects. This workflow creates a self correcting system of data driven cost estimates, allowing us to be as accurate as possible. We believe that a good general contractor should provide their clients a measure of risk management. As such, we factor in a percentage based contingency that is intended to cover unforeseen expenses within the agreed upon scope. If we don’t need it, we don’t spend it. Our estimates are structured in a simple fashion so you can mentally include or exclude contingencies with ease. All our estimates are provided with percentage breakdowns to facilitate effective value engineering, should this be necessary at any point. We are excited to take the lead on your project. Our budgets are clear and will provide you with all the information necessary to make educated financial decisions throughout the course of our work together. Our schedules are comprehensive, entailed are decision dates, order dates, long lead times and critical path. This enables all responsible parties to understand how they fit in to the bigger picture. Scope changes; It’s simply the nature of the work we do. We take it upon ourselves to provide the client with a very clear picture of where we are starting from in terms of budget and project timeline, up until the final product. Where we really differentiate ourselves is in our ability to track and illustrate shifts from this baseline throughout the course of a project. We provide our clients with a best in class change order management workflow. You will get the opportunity to approve each and every scope adjustment real time, both in terms of time and money. Critical task Lists are leveraged to make sure that each responsible party understands exactly when their contribution needs to be finalized in order to keep the project on track. clients, Architects, and Designers find this tool incredibly valuable when it comes to broad collaboration. Open book invoicing is one of the clients greatest advantages when working with Newschool Builders. The system shows every single line item for billing, it also includes digital time card data for our labor team on your project. Moreover, digital copies of all material, subcontractor, and vendor invoices are available for review at any time. In addition to this high degree of visibility, we are also capable of projecting remaining expenses on each and every invoice. This is an invaluable tool for mid-project financial decision making. Allowing for scope adjustment and variable cost selections. We only want to provide you information that is valuable. Clients are encouraged to select the necessary level of management service given your personal requirements, and adjust as necessary throughout your project’s development. You have invited us into your lives, and commissioned us to create a space for you to spend time with the people that matter most. This is an intimate process that we are honored to play a role in, we do not take the responsibility lightly. All projects start on a good note, otherwise they would’t start. Our commitment is that we will end as friends; on better terms than when we started. We have a list of legacy clients who will attest to this. This is very specific outcome, and it’s achieved through purposeful methods. We make use of a RACI Matrix (Responsible, Accountable, Consulted and Informed) to define rolls in our projects. This helps us avoid shared ownership or neglect of critical elements of collaboration. This tool, coupled with our cloud based management systems, enables early detection of harmful trends, allowing us to work through challenges before they manifest themselves. We offer a Warranty on our work. Furthermore, we offer a guarantee that extends beyond the terms of that warranty. Our success is strongly based on our reputation. While the requirement for warranty work is very infrequent, we have been known to go back to a client’s home years after a project has been completed to make things right at our own expense, long beyond the warranty period’s expiration. We live here, we work here, we play here. 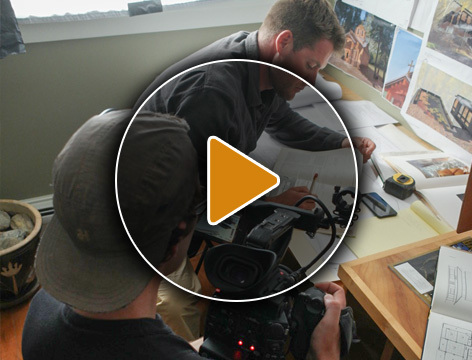 Newschool Builders has been a staple in the central Vermont community for more than a decade. We will be neighbors once your project is complete, and that’s how you’ll be treated.